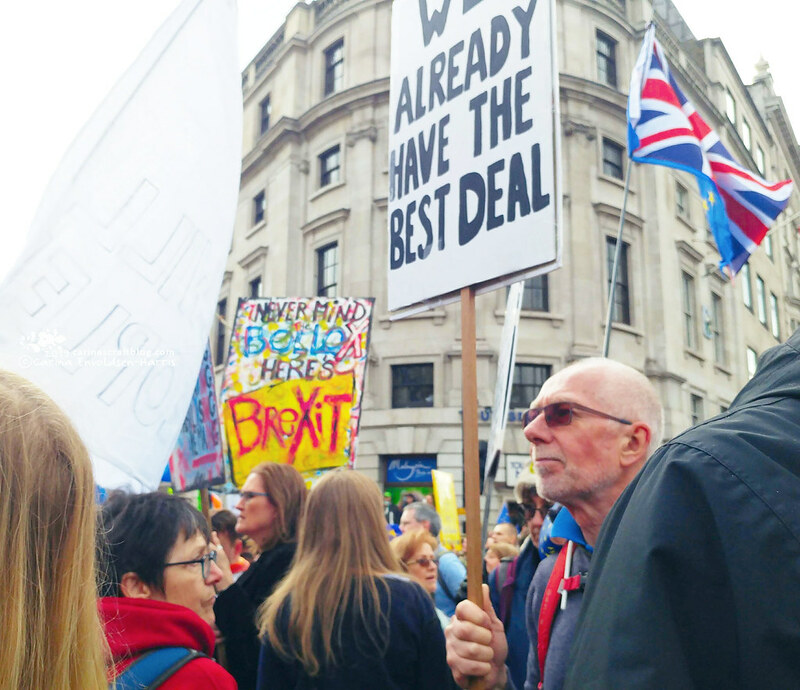 On Saturday, I took part in the Put It To The People march in London. And I’m SO glad I did! 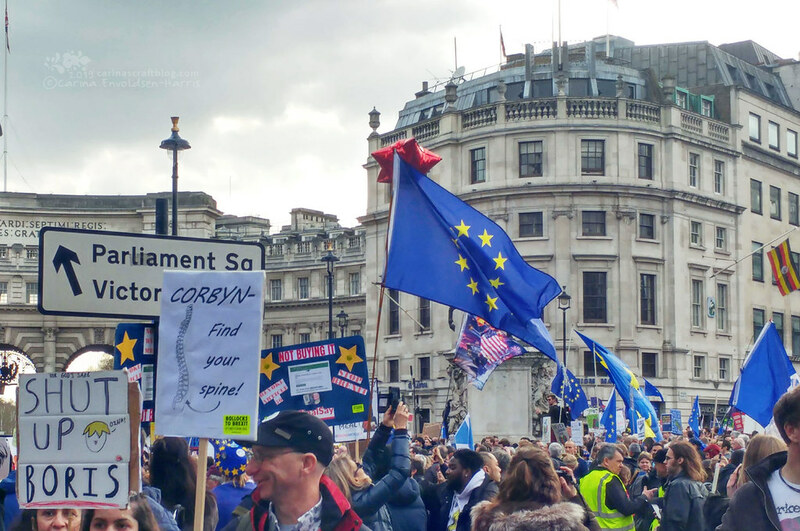 I’ve not been able to go to any of the previous marches against Brexit and now it feels like we’re at the eleventh hour and it is more important than ever to stand up and be counted. To somehow give my opposition to Brexit a physical manifestation. Especially since I wasn’t allowed to vote in the referendum. As far as I know, there wasn’t a single incident that required the police to step in. I saw a photo of a police officer doing sudoku! But whenever pro Brexit people march, it always seems very aggressive, even in small numbers. I wonder why that is? I am happy I took part, although I never actually made it to Parliament Square. 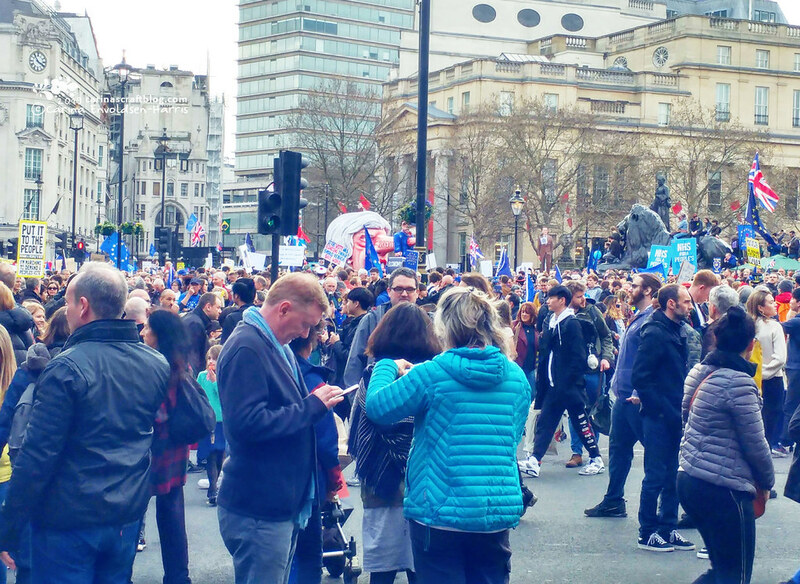 It all got to a stand still at Trafalgar Square and Whitehall because there were so many people there. So around 4 PM I decided to head for home. It was lovely to see people all along the streets with placards and stickers on their jackets and flags etc. Even after leaving the march, it still felt like we were all part of it. Contrast that with arriving back in the town where I live. By the time I got off the train, I had taken off my EU badge, my blue and yellow scarf and wrapped my placard in a carrier bag. 70% in this town voted to leave. And I fear being attacked by someone who doesn’t think you should even be allowed to protest the referendum result. Especially if they realised I’m an EU citizen. It makes me sad that I have to fear for my own safety. Maybe I’m just imagining it, but why take a chance..? 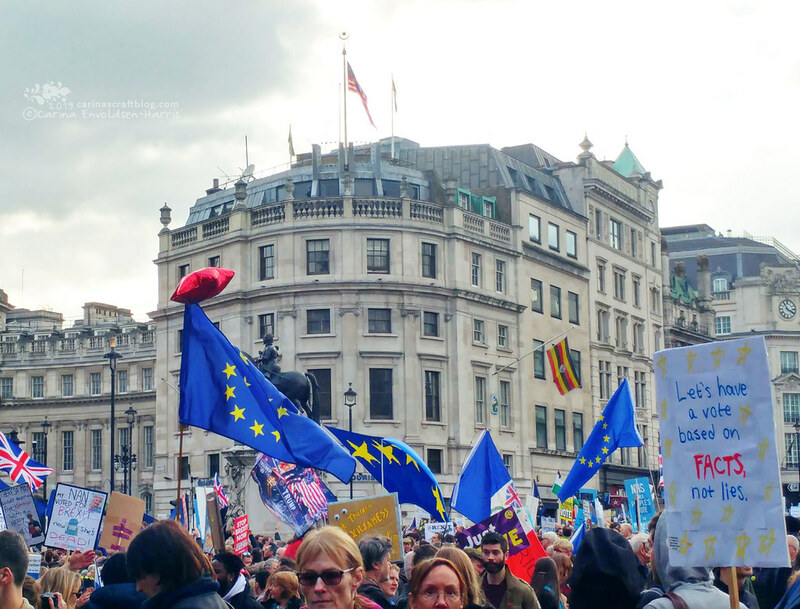 If you were not able to take part in the march, please sign the petition to revoke article 50. I know I mentioned it on Friday, but it very much bears repeating. The petition now has close to 5.5 million signatures, but it needs more! Especially since the loathsome Andrea Leadsom said that if it reaches 17.4 million signatures then they will have to pay attention. Well, challenge accepted! Please, please share the petition with anyone you know, on Facebook, Twitter, your blog, Instagram etc etc. But also share it in person or send the link via email. If one person shares it with 4 people who sign and share it with 4 people etc etc, with just 10 ‘tiers’ that’s 262,000 people. Or if 5 people share with 5 people who share with 5 people, that’s almost a million! Even if this petition doesn’t get article 50 revoked, it is still a very important signal to send to the politicians. That people do not want Brexit. And it is also an important signal to tell the rest of Europe that the majority does not want Brexit. 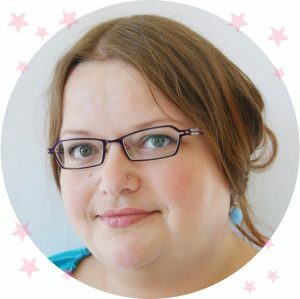 If you are UK citizen OR a UK resident you can sign the petition! So unlike they referendum, EU citizens can sign the petition too, as well as anyone else who is a resident in this country. AND there is no age limit, so teens/kids can sign it. They just need an email address. Please get everyone you know to sign it. Pass it on. Help people who are unsure how to do it. Here’s a site that breaks the signatures down by constituency. It is quite interesting to see how the number of signatures in some constituencies far outnumber the number of people who voted for the MP in that constituency. I live in New Zealand and we feel for you. We never here imagined the people would vote for Brexit or a referendum on such a huge decision would be considered binding without at least a two thirds majority. From here, EU membership seems like a huge privilege though I realise there are responsibilities with every privilege. I sincerely hope parliament comes to its senses on this. And I feel deeply concerned for EU citizens in the UK and vice versa. The rise of xenophobia is deeply disturbing.